First and foremost, welcome to the Saint Ann School family! We are thrilled that your family is interested in our school community and we hope that the information we are providing in this section of the school website will help answer some of the most frequently asked questions. While we have tried to answer the basic questions here, we invite you to call the school office (615-269-0568) at any time to ask additional questions. We enjoy talking about our school and want you to have all the information you need to make your school decision. What is Saint Ann School's uniform policy? Saint Ann's uniform code can be found on the Dress Code Page of the school website and in the Family Handbook (pdf). The uniform can be purchased through Dennis Uniforms. Some of the pieces such as the navy shorts or pants can be purchased from any retailer that sells school uniforms. The HSA sponsors a Used Uniform Sale at least once a year allowing families to re-purpose uniforms that no longer fit and purchase used pieces at deeply discounted prices. It is important to make sure students comply with the dress code at all times, so we appreciate your taking the time to review the uniform requirements in the Family Handbook. During the school year, there are several Duds Days, or uniform-free days. Students get a Duds Day during their birthday month, and during special occasions throughout the school year. On occasion, students may "purchase" a Duds Day by contributing to a charitable drive or participating in special school activities. Duds Days are always announced in advance and listed in the school calendar. The out-of-uniform code is described in the Family Handbook (pdf) and it should be observed on any Duds Days. What are the school hours and arrival procedures? School hours are 8:00 am to 3:00 pm each day. 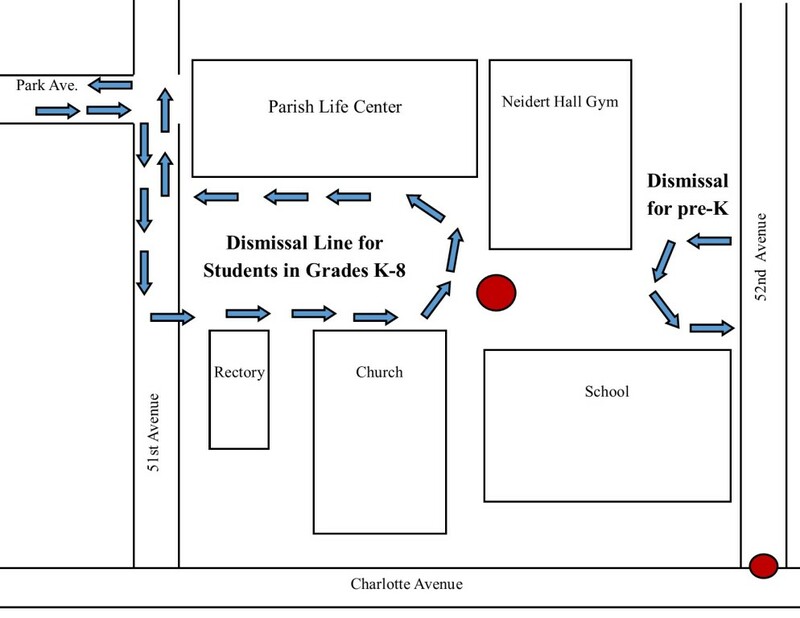 Students who arrive between 7-7:45 am need to be walked into the gym for supervised care. At 7:45 am, a faculty member will be in the parking lot to accept students and parents may pull their car through and drop off in the parking lot. Students should not be dropped off outside unless a staff member is present. Students enter the building at 7:45 am. Those who arrive after 8:00 am are considered tardy and must be escorted to the school office and signed in by a parent or guardian. What about pre-K students? Do they have different school hours or arrival procedures? Pre-K students can arrive anytime after 7am and must be walked to the pre-K classroom. Once in the classroom, parents will be asked to sign their children in with the teacher on duty. Where do I park if I have to come to the school? You may always park along the curb on 52nd Avenue alongside the school or in the parking lot. If you choose to park on the street, please park only on the side of the street next to the school property. If you anticipate that your visit at the school will extend beyond 2 pm on a school day, please do not park in the parking spaces in the parking lot as you will interrupt the school dismissal process or your car may be blocked and delay your departure from school. During special events, all spaces generally become filled quickly. During those times, it is common to see families parking their cars on the curb alongside the church property on 51st Avenue just across from the intersection of 51st and Park Avenues. How do I get to the school office? For security purposes, the school doors remain locked at all times. You will need to go to the office through the front doors of the school on Charlotte Avenue. You may either park on the 52nd Avenue side of the school and walk to the front doors or you may park in the parking lots behind the school/church and cross through the courtyard gate between the church and the school to walk to the front doors. Press the buzzer at the front doors to gain access to the building and the main office is at the top of the stairs on the right. What if I need to drop something off for my child? We discourage parents bringing homework, projects, or paperwork left at home to your child at school. Not only does this put unreasonable expectations on you as the parent, but it doesn't help teach the child responsibility. We all need to understand there are consequences for what one does or fails to do - this is especially true for children. You may bring a child's forgotten lunch if you want, but remember that children without lunches will be fed - children won't be left without a lunch. When should I arrive to pick-up my child and what are the dismissal procedures? Does Saint Ann School offer BeforeCare or AfterCare programs? Yes, Saint Ann School offers complimentary BeforeCare in Neidert Hall from 7:00 am through 7:45 am each school morning. We ask that all parents walk their child into the gym to utilize this option. At 7:45 am, a faculty member will be in the parking lot to accept students and parents may pull their car through and drop off in the parking lot. All students are dismissed at 3pm and St. Mary's Child Care Center provides an AfterCare program and from 3:00 pm through 6:00 pm each afternoon. The program provides opportunities for physical activities (outdoors weather permitting), quiet play, staff-supervised homework and snack time. AfterCare is a fee for usage program. What is RenWeb and how do I sign in? Renweb is the online communication tool Saint Ann School utilizes to provide parents with updated information about classes, grades, homework, upcoming events, and school closures. One of the first things you should do is set up a parent account on RenWeb. Please see the information below for registering and signing on. If you have any questions about RenWeb, please contact Krystal at krystal@stannnash.org or Kelly at kelly@stannnash.org. All returning parents should have access to the site through the password they set up and used last year. If you do not remember your username and password, both can be recovered through the website. Saint Ann School uses RenWeb as the main communication source; please be sure to create an account. In addition to grades, you can view resource documents (archived Tidbits, flyers, forms, menus. etc), check the calendar dates, see announcements and update your family information. If you have trouble logging in, please contact Kelly Braniff at kelly@stannnash.org or Krystal Johnson at krystal@stannnash.org. What is the best way to contact my child's teacher? Although we prefer face-to-face meetings whenever possible, we realize that in our busy world that is not always possible. The Staff Page of the school website lists each teacher's direct phone line and e-mail address. You may also call the school office and leave a message for the teacher. Teachers may have different preferences regarding communication, so you may want to check with your child's teachers as to the most effective way to communicate with them. What is the Tuesday Folder? Each Tuesday the students receive their Tuesday Folders containing their classroom work from the previous week, news and updates from their teachers and important forms and announcements from the school office. Parents should take the time to review the contents of each student's Tuesday Folder with their child to make sure the contents of the Folder are shared and forms are completed and returned promptly. What is the Tuesday Tidbits? Where can I find it? The Tuesday Tidbits is Saint Ann School's weekly newsletter published each Tuesday and emailed to parents, grandparents, and friends of Saint Ann School. The newsletter is full of news and information regarding school events and activities as well as other important information and pictures. Archived Tidbits can be found on RenWeb. When do students go to Church or celebrate Mass at Saint Ann School? All students celebrate Mass together each Wednesday and Friday from 8:00 am until about 9:00 am. Parents and family members are always welcome! Are volunteer hours required? What volunteer opportunities are there at Saint Ann? Volunteer hours are not required, but are highly encouraged. Families can demonstrate their commitment to the school's Christian philosophy and mission through example by volunteering their time and talent in helping the school community. Families who volunteer get to know the school staff, meet other families and experience first-hand what goes on at Saint Ann School. It is the volunteers who make many of the events and activities held at the school possible. There are volunteer opportunities to suit the interests and time availability of every family and families can choose their level of involvement. The Tuesday Tidbits as well as emails from your Classroom Coordinator will offer many opportunities for parents and grandparents to get involved at Saint Ann School throughout the year. Does Saint Ann School offer a hot lunch program? Yes, Saint Ann School offers a hot lunch program for all grades provided by St. Charles Catering. Menus are provided a month at a time and you may view the menu and order your child's lunch online at the St. Charles Catering website. Saint Ann School does NOT accept lunch orders or payments. Can I have lunch at Saint Ann School with my child? Yes, parents are welcome to join their children for lunch. Please let the homeroom teacher know in advance if you plan to visit during lunchtime.